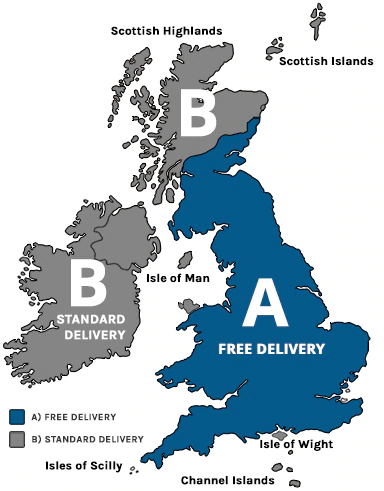 Because we offer such a wide variety of products, some of which are made to order, we work with a range of delivery companies. As a result, we don’t have an online delivery tracking system that you can use. However, if you contact our friendly customer services team they will be able to update you on the status of your order. Do I have to be present to sign for my delivery? Delivery of large furniture items, such as bedroom furniture, will require an adult's signature at the point of delivery. Delivery of other items also requires a signature at the point of delivery, unless you have added instructions during the checkout process to request that your order is left with a neighbour or in a safe place on your property if you are out. Please note that if you are not present to sign for your order and it is left with a neighbour or in a safe place on your property as you have instructed, that this is done at your own risk. We cannot take overseas orders through our website. To enquire whether we can ship to your country, call our expert customer service team on 0117 330 2277. Kids' Rooms advises that customers who foresee difficulty in obtaining their item at a home address should state a different delivery address at checkout. If your delivery address needs to be changed after the checkout procedure, please call us on 0117 330 2277 and we will get this changed for you, however this may affect the speed of delivery. You need to notify us of any access constraints to your property, such as a narrow road that a lorry could not fit down, or lack of free, legal parking for delivery vehicles. This is so that we can plan your delivery and ensure that it is successful. If you live in a flat, you need to let us know which floor you live on and whether there are usable lift facilities in your building. This is so that we can ensure we are able to deliver your order successfully to your door for you. For all large furniture deliveries over the value of £250 you need to notify us of any access constraints that may affect delivery, bearing in mind that some furniture items are delivered fully assembled. Typical constraints include narrow passageways, stairways, low ceilings and unusual doorways. It is the customer’s responsibility to check that the furniture can pass through doorways, stairways, etc. If you are at all unsure, please contact us for advice; in many cases assembled furniture can be delivered unassembled and then assembled in your room of choice for you. For all large furniture deliveries, you need to notify us of any of these constraints as soon as possible, and at the latest within 7 days of receipt of your order confirmation. If your delivery is refused by our home delivery company or any 3rd party delivery company acting on our behalf because of access constraints that we have not been informed of, we reserve the right to charge you a redelivery fee of £100.